Twenty wins. Zero losses. Thirteen wins by knockout. Otto Wallin has been quickly climbing the heavyweight ranks since turning pro in 2013. 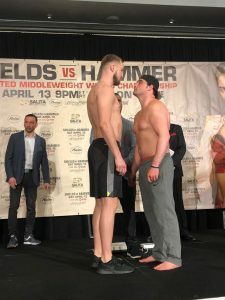 Having already established himself in his native Europe, the native of Sundsvall, Sweden is now in America, and ready to make his US debut against the 21-4-1 Nick Kisner this Saturday night at the famed Boardwalk Hall in Atlantic City, New Jersey. The 10 round bout, which is on the undercard of the much anticipated Claressa Shields-Christina Hammer middleweight unification showdown, will be aired live on Showtime. It’s a coming out party, of sorts, one which the nearly 6’6, 28 year old heavyweight intends to make the most of.